One thing about creating a fantasy world is the magic. What kind of magic system will it be? There are so many possibilities. I’m creating one for my world and it’s been one of the most fun things so far to do. The magic isn’t a major part of the story but it will be used in parts of it. My characters use spells, rituals, and have staffs or wands. The characters have been created to go in a couple of the stories I’m working on. Each of them are unique to those stories. 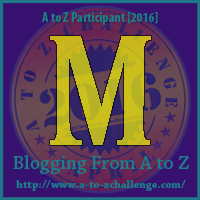 Will introduce those characters after the A to Z challenge is over because they are still in development. One of my favorite magical worlds is the one in Harry Potter. I love that series. What are some of your favorite magical worlds? I like the Harry Dresden series for its mix of magical and mundane.